our little family loves moseying around yarraville. pah-lease, who doesn't, you ask? well, if we're not at the corner shop for a weekend breakfast, lurking amongst the treasures in the second hand junk shop, trying to keep up with mirka at her favourite park or indulging in some pear & dark chocolate (pear & dark chocolate!) dessert pizza at l'uccellino on a rare night out, then you'll find us at hausfrau bakery. gawd that place is good. i'm a little addicted to their minted chicken baguette for lunch at the moment, but let me tell you, if paying 4 bucks a pop for a mini treat is your kind of way to sink your cash, then this place is for you. and me. We love Yarraville too, even though we live on the other side of town. Those sweetie treaties look worth every cent! 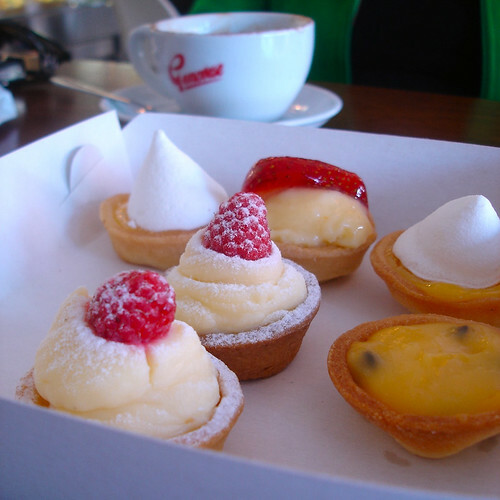 man, i need that passionfruit tartlette number, that looks like exactly what i need stuck up at home with the flu! *drool* i want a minted chicken baguette. and one of those delicious cream concoptions. yum! 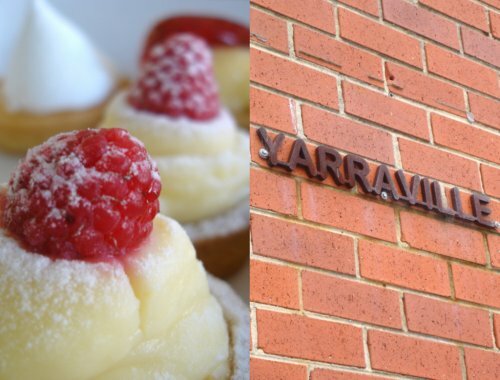 have never been to yarraville but must go now - those treats look amazing! We love Yarraville too .... I work in the "village" at the kids shop and its such a great community!! The Corner Shop in my hang out but now that I have seen a picture of these delicious treats I will be heading to Hausfrau first thing ... YUM! I have just discovered your beautiful blog and become a follower too. One day I will come and visit you guys in Australia and you have to take me to this place. Deal? by the way, thanks on the comment you left on my blog. Much appreciated! ah...thank you. i am always looking for new places to mosey about. I love your junk shop finds! Did you spruce these up? They look fab as they are. I love finding little treasures in junk shops..you just hope it's your little secret and no one else's!! p.s Thanks for your tip on using mirrors in the bathroom - would love to see any images you had where you used them? I think they look stunning, but haven't thought about the cleaning factor! !